It has felt strange to not be obligated to write every day. November 1 was probably the strangest day. I went to town scrubbing the kitchen around midday because I had hours to kill before a social dance and I was set on taking a break from writing, but I didn’t know what else to do with myself! Now I’m ready to get back into it. Time will tell if October’s writing challenge left a lasting impact on me, and if I end up posting more frequently. First thing’s first though: would you like to know what it’s like on the “other side” of the ballroom at a competition? About eight months ago, Teacher introduced me to the woman who was managing the on-deck area at the California Open. She works many other competitions as well and is always on the look-out for people interested in working as runners. I was interested in getting a “behind the scenes” look at ballroom comps, so I gave her my email address to add to the “interested” list. 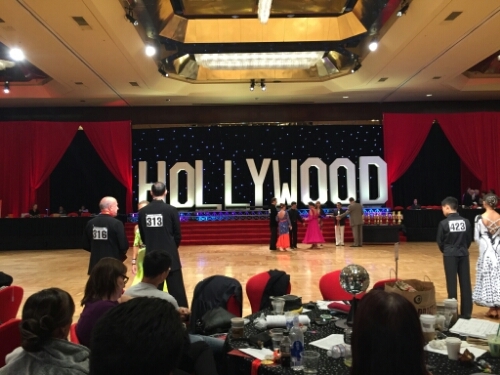 I didn’t hear a peep from her until a few weeks ago when I received a mass email asking for volunteers to work as runners at the Hollywood Dancesport Championships. In exchange for a 4-hour shift, runners would receive a ticket to another session of the competition. It’s a cool deal if you want to watch a pro session, which is always more expensive, or if you’re entered in the comp because you could get your ticket for the session you’re competing in. I was hesitant. I knew I wouldn’t be able to attend another session. The comp was over an hour away, I would have to go home after my shift to take care of my pups and I couldn’t spend the gas to drive back up. Could I even spend the gas to drive up once? In the end, I felt like I shouldn’t pass up the opportunity. Teacher was going to be competing with students for the first time since his injury, so if I volunteered for the session he was in, it was also a chance to support him and my fellow students without paying for a ticket. I had no idea what to expect. I volunteered for the Saturday morning session that started at 9am, and I ended up getting there before my “boss.” Cue standing around trying to look like I belonged. Once Boss arrived and the dancing started, I found out my sole duty was to collect scoresheets from each judge on the floor as they finished them and “run” them back to the woman entering the scores on a computer to tally people’s results. That was it! Working at a comp was kind of like seeing the back side of the rhinestoned jewelry that dancers wear. On the front side, it’s all sparkles and colors and brilliance! On the back, not so much. Everyone working seemed to have been doing their job for ages. They were over the glitz and glamour. It was just another day in the office for them. And I was the new intern fetching scoresheets (as opposed to coffee). So I was pretty much invisible unless I got in someone’s way or messed something up. But it was fine, I was happy to not be so jaded yet that I couldn’t enjoy watching people dance. At one point, there was a little girl, maybe around 10, and an older woman, maybe in her 80s, dancing at the same time! It was fun to witness the range of ages on the floor! It was also interesting to watch the judges. I was always told that as soon as I enter the ballroom, I should assume I’m being watched. Teacher has coached me on how to walk onto the floor, how to stand, how to approach him, how to bow at the end of a dance and how to walk off the floor, because all of these things can be taken into account by the judges. I can now confirm it’s true! Not for every judge though. Some would finish marking people and pull the sheet off their clipboard for me to collect halfway through a song. Others would wait until the song was over and continue to watch people until the next song started before making their final decision. In the end, I worked about 4.5 hours before thinking about calling it quits. Boss had left the on-deck area long before, and the woman who took her place didn’t know what to tell me. I felt weird just leaving, so I texted Boss to see if I was needed for anything else and if not, I was heading out. I wasn’t needed, so I got my parking ticket validated, said good-bye to Teacher and headed home. Ultimately, I’m glad I took the opportunity to get a glimpse at a different side of competition. Would I do it again? Yes, if it doesn’t end up costing me so much. I realized after I left, I should have asked about getting my hotel parking fee paid for, since I wasn’t taking a session ticket. Next time. I have a feeling that my invisibility cloak will wear off after I’ve worked a few comps and I stop being the “new girl.” Teacher was enthusiastic about me getting to work at a comp because of the possible future opportunities. I am skeptical, but you never know. Ballroom is definitely a world where it helps to have people know and recognize you. I’m glad to have had the chance to see the less glamorous side of competitive ballroom, where all the cogs and gears are working to keep the comps running smoothly. You don’t realize everything that is going on behind the scenes when you are wearing your pretty dress and fake eyelashes. And how did I feel watching others compete with Teacher, something that I’m currently restricted from doing? You will have to wait until tomorrow to read about the ups and downs of that experience!